**UPDATE - Team Oracle won, greatest comeback story in Sports! 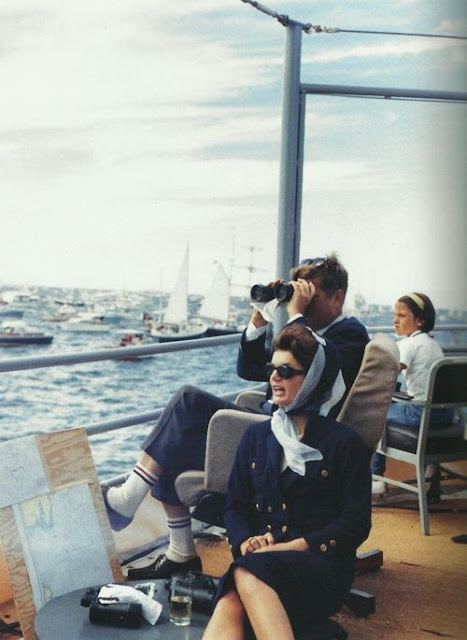 Not sure exactly where I found this image, but thought it was incredibly romantic in its' portrayal of John and Jacquie Kennedy enjoying the sailing life - also watching the America's Cup races! Can you see the charts near Jacquie? The harbor packed with sailboats and spectators? Not to mention her iconic, fabulous style! You can almost smell the salt air, feel the excitement of the race and feel the sea breeze. I am not usually one to be drawn to the images of "Camelot", but this one just grabbed me, and I had to share. Oh, I love that quote. Reminds me of Isak Dinesen and her words: "The cure for anything is saltwater - tears, sweat or the sea." I just love this image and his quote I did not know the races were gong on. How exciting. I have fond memories of the one time I soles on the SF Bay. It was like a dreamy movie. Sailed. Spell check got me again!